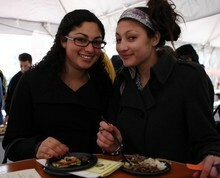 More than 250 students braved torrential wind and rain to sample culinary offerings donated from 18 local restaurants at the first Taste of Morningside Heights, held under a tent on Low Plaza on April 20. Co-sponsored by Inside New York, the Center for Career Education and Bacchanal Events, the event raised nearly $1,000 to help local charities — via Columbia’s Community Impact initiative — fight hunger and food insecurity. Katie Han ’09, dining editor for Inside New York — Columbia’s comprehensive annual guidebook to local culture — was the event’s mastermind. With New York’s restaurant business struggling and philanthropic efforts at a minimum, Han wanted to find a way to provide local businesses with some extra exposure while raising money for Community Impact.